My friend Beth (and running partner) stopped at K-Mart before leaving for Chicago and bought us some sweats for throwaways. The gloves and arm warmers I planned to hand off to D around mile 4, where he and Beth’s husband, J, anticipated to catch us. Worst case scenario, I could toss the arm warmers and fold up the gloves and jam them in my run belt. Before we left our rental. I hadn’t suited up with arm warmers or gloves yet. However, I digress. 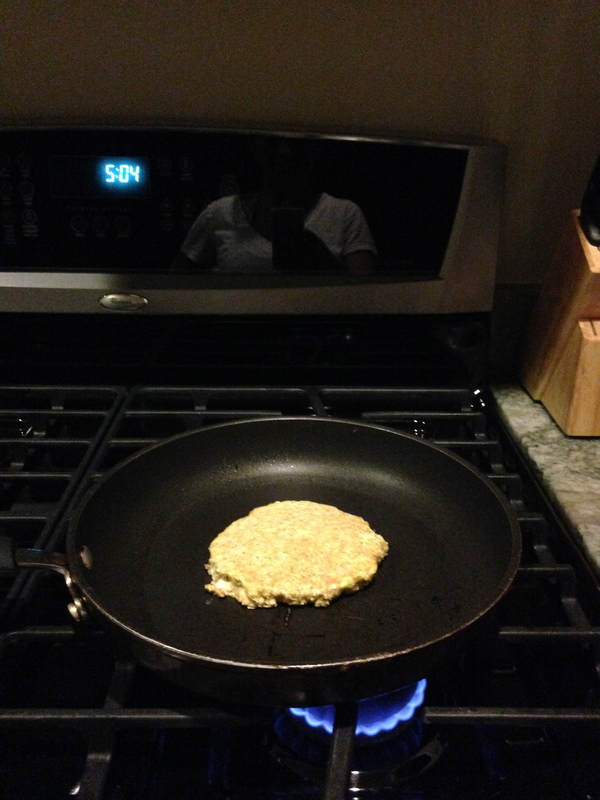 The first thing I did when I woke up was go have a cup of old coffee from the day before (mmmm… ) and make my usual pre-long run pancake: one egg plus half a cup of oatmeal. I topped my pancake with some peanut butter and ate half of it. Then D pointed out that it was still early and we wouldn’t be starting our race until past 8 AM, so I set the other half aside to take with me. We were meeting a friend staying at a hotel just a block away at 6 AM so we ran out of our apartment just after D took the photo of us above. Just as we were walking to our friend’s hotel, I realized that not only had I forgotten the other half of my pancake, but I’d also forgotten a KIND bar. I considered running back to the place, but my friend’s hotel was giving KIND bars to all of its guests and they offered me one. I grabbed it and decided I would look for a Starbucks when we got downtown and buy some oatmeal. 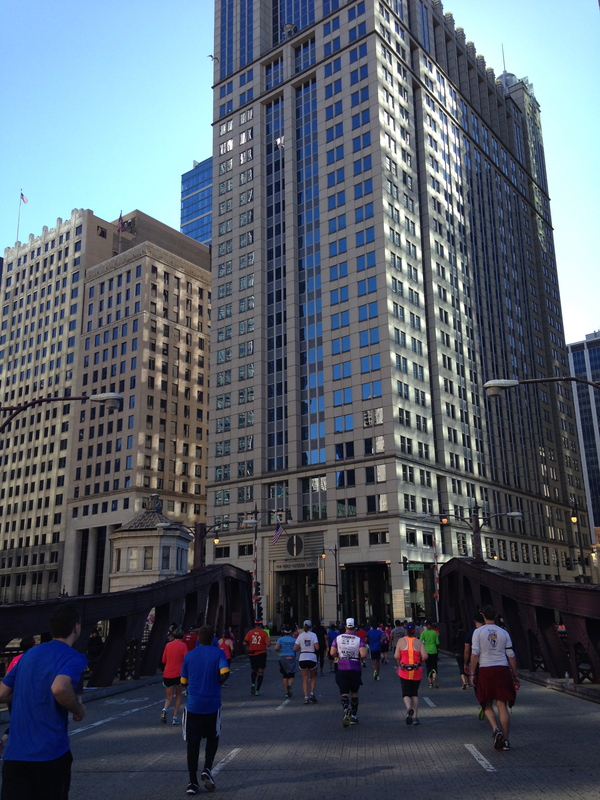 We were staying near the north end of the Magnificent Mile and had planned to walk the mile and a half down to Grant Park. The streets were dark and there were a few people clearly left over from the night before. But more and more runners kept popping out and hitting the streets. We picked one, like the stalkers that we were, and followed her. She led us straight to a subway station! Waiting for the train downtown. We made it downtown with plenty of time to find a Starbucks for my oatmeal. We said goodbye to our friend (who’s faster than Beth and I and had an earlier start time) and headed to the Starbucks off S Michigan Ave and E Balbo Ave. As I sat eating my oatmeal, I decided this was a good place as any to meet after the race so I texted the location to D for our post-race meet-up. We then made our way to the corrals. Security was very similar to that of an arena sporting event: you had to have a ticket bib to get in, and they searched all bags (including my run belt). 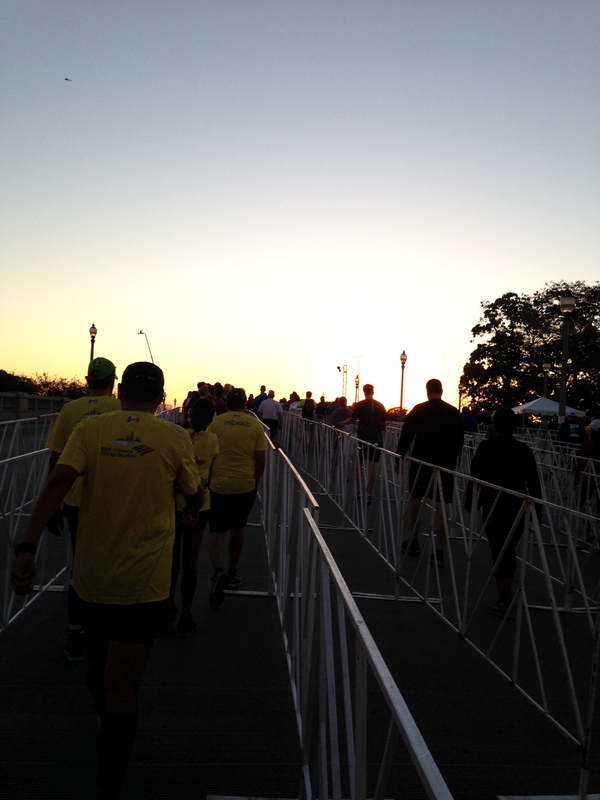 I felt safe entering the starting corrals. Then came the wait for the start. We are used to very early morning run start times in order to beat the Florida sun, so having to wait until after 8 AM to start a run was like torture. Beth and I both agreed: we just wanted to get this hell train moving. We could finally see the start! When we started to make our way towards the start line, I shed my sweat pants and added them to a pile of other runners’ throwaways. It always makes me feel better to know that they get donated. As we crossed the start line, Beth hit start on her Garmin. Which reminds me … we should probably talk about this Garmin. You see, during training we used the Garmin that I borrowed stole from my husband. That is, however, until one week before the marathon when the plastic on the back of the watch broke in a way that the band broke off. Through social media Garmin directed me to their Customer Service, who offered to send me a refurbished watch for $99 in time for the Chicago Marathon. This was super awesome of them, but I haven’t had the best of luck with refurbished anything so I opted against this. I was considering buying a new watch when Beth mentioned she had one she never used. We took it for a test run on our last long run and everything seemed to work out fine, so I decided not to buy a watch right away. I have plenty of other financial obligations right now and not having to add to that was a huge relief. So we started running. And it was beautiful! I was too distracted by all of the pretty buildings and the awesome crowds to really give it much thought. I assumed it beeped and she just missed it. We walked so that she could figure it out. So we start running again and I suggested we run through the next walk break since we had lost so much time. Again I got lost in the beauty of the city. 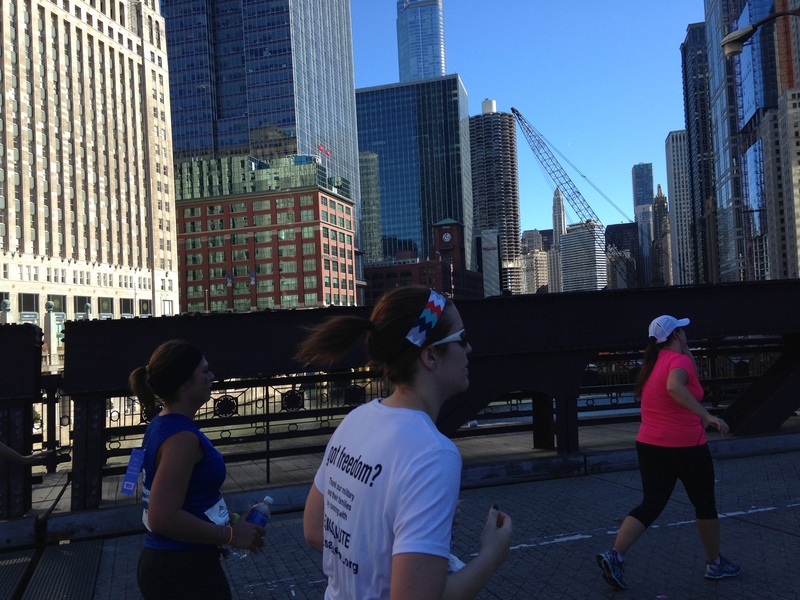 The best way to get to know a city is to run through it. Beth’s Garmin beeped to let us know that it was a minute walk break, but we ran through it. Then Beth said, “Uh oh… Something’s still wrong.” The watch never beeped to let us know our minute was over. We again slowed to a walk and she started to tinker with it again. At this point I started to make suggestions: that we could run the entire marathon, walking at water breaks; that we look around and find someone else doing intervals and just follow them. With every suggestion Beth looked at her watch harder. I think my back-up plans were making her nervous. Finally she handed me her watch, where I found that she had set the watch to “run five minutes and walk one hour” intervals. 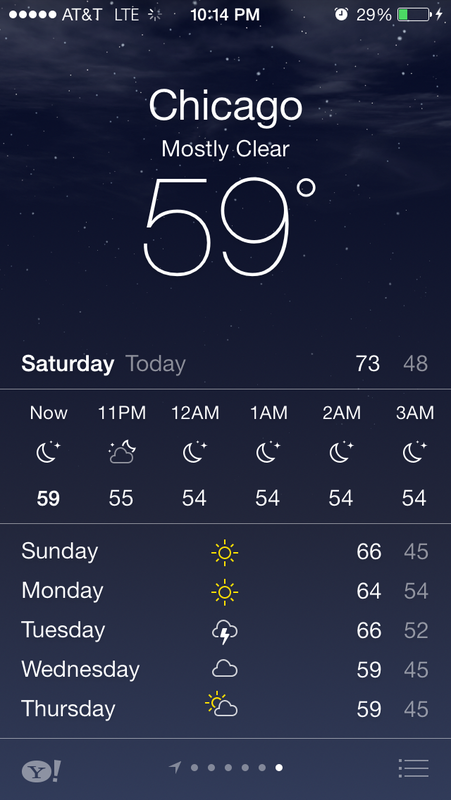 Ha ha ha ha ha ha … We fixed this and started running again. This time we ran through two walk breaks since we had to make up some serious time. Around mile 4 we started to look around for our crew. I was eager to shed my gloves and arm warmers. Also, I had forgotten to bring sun block so I wanted to get some on before I started to burn. I spotted my husband not long after and then noticed he was standing near a familiar face: my friend Rox had flown in to surprise me! Me trying not to sweat on Roxy. 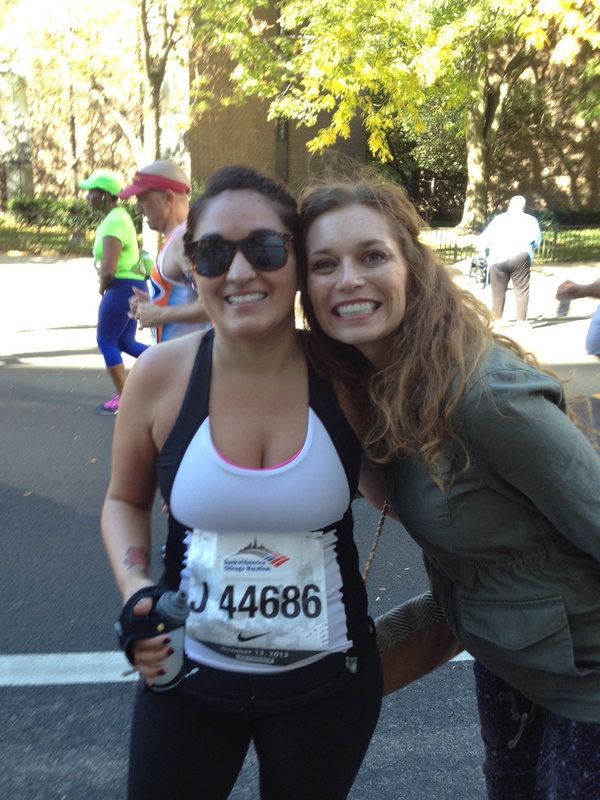 Rox pointed out that she had never missed any of my marathons, which is very true. Yay! They slathered me up with sunblock after I discarded my arm warmers and gloves and then Beth and I were on our way. 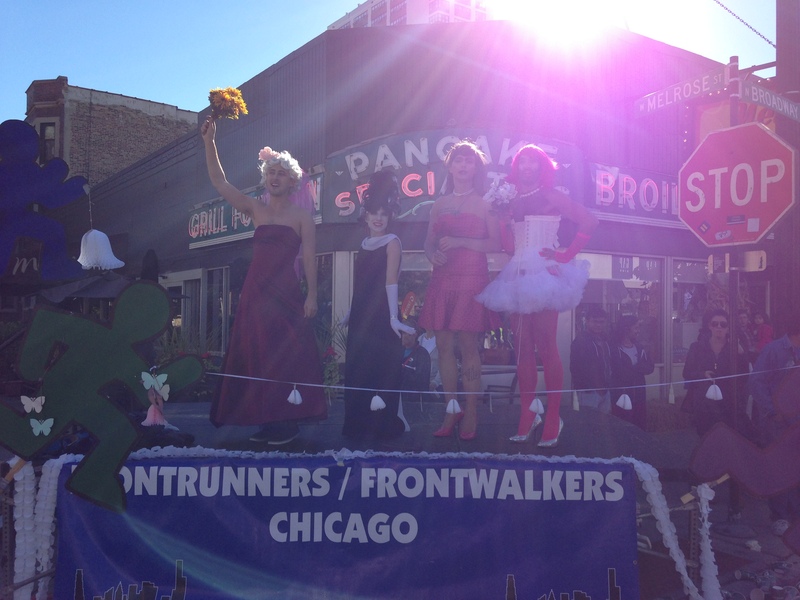 Between miles 4 and 11, the next time we would see our crew, we ran through Chicago’s Boystown and Old Town. The energy was AMAZING. And I always love a guy in drag. Somewhere around this time, I had to the use the restroom. We had already run by the first set of portable potties due to the long lines. When the second set came up, the lines were still crazy, but I didn’t want to gamble on running to the third set. We lost around 10 to 15 minutes waiting in line. I could just see our goal of 5:30 slipping away from us. We finally got back on the road and ran through some more intervals to make up more time. Then, as we had finally started to think nothing else could happen with this damn watch, something worse happened: Beth’s Garmin died. I didn’t know whether to laugh or cry as Beth yelled expletives at her wrist. I suppose it was meant to be for us to run without the beeps. We started to estimate intervals from the time on my phone. That was fun. Seeing my husband was a sight for sore eyes. Then off we went with Beth’s husband’s watch to guide the way for the next 15 miles. I meant to get a photo of her wearing a regular timepiece during our run, but forgot. We were too busy trying to make up lost time. But trust me, it made me chuckle every time I looked over at her. But thank God for that watch; I had grown tired of looking at my phone. Beth was distracted with estimating five and ones on her husband’s watch. I was distracted looking for runners that were running the same intervals as us. We saw our crew later around mile 19 in one of the Spanish neighborhoods of Chicago. I suspected that Rox, who had lived in Chicago before, was getting them around the city. It was great to see them a third time! 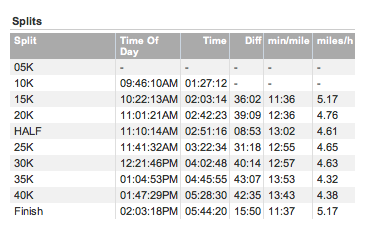 You find out a lot about yourself and others when you race a marathon. 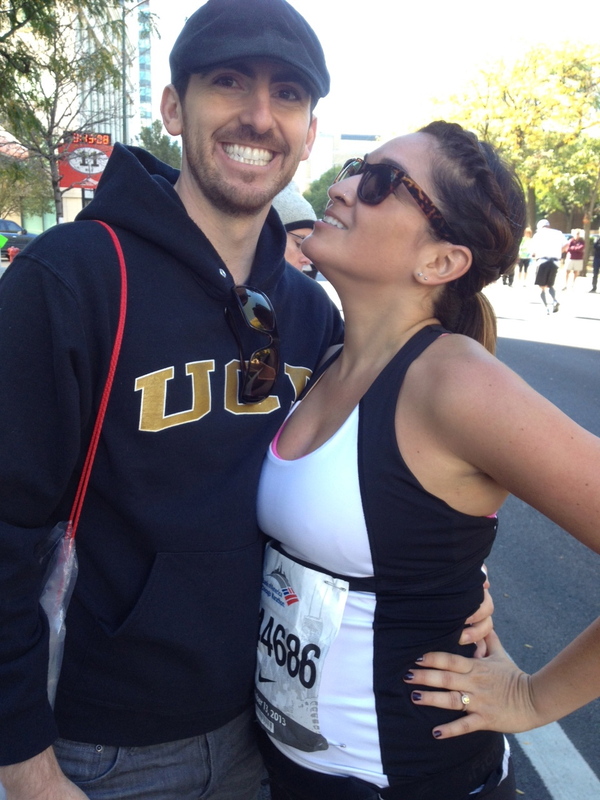 During this marathon I found out that Beth and I will take pretzels from complete strangers. As the mile numbers neared 20, more and more people started to offer us pretzels and we would take them in any shape or size. I think the pretzels, coupled with our peanut M&Ms and our chews, are what kept us from hitting a wall. 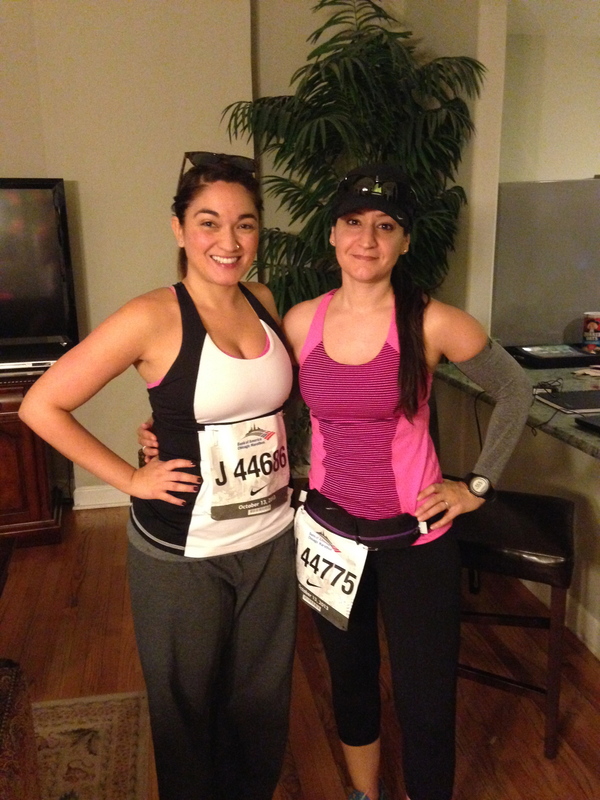 Sure, my legs started to get sore, but I still had energy and so did Beth. Our crew was surprised to see us so upbeat at mile 19. As we approached the 26 mile marker, we saw our crew cheering us on. It gave us a pep in our step. 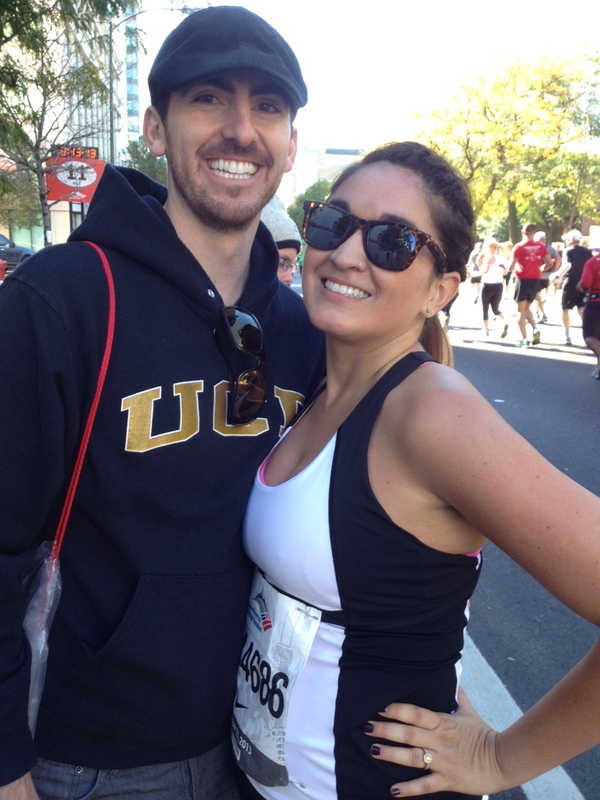 We were running that marathon high when we rounded the curve and saw the dreaded uphill. I had heard that there was a hill before the finish… I just didn’t realize that it was right before the finish. We didn’t discuss whether to run or walk uphill; we both just powered on up the hill. 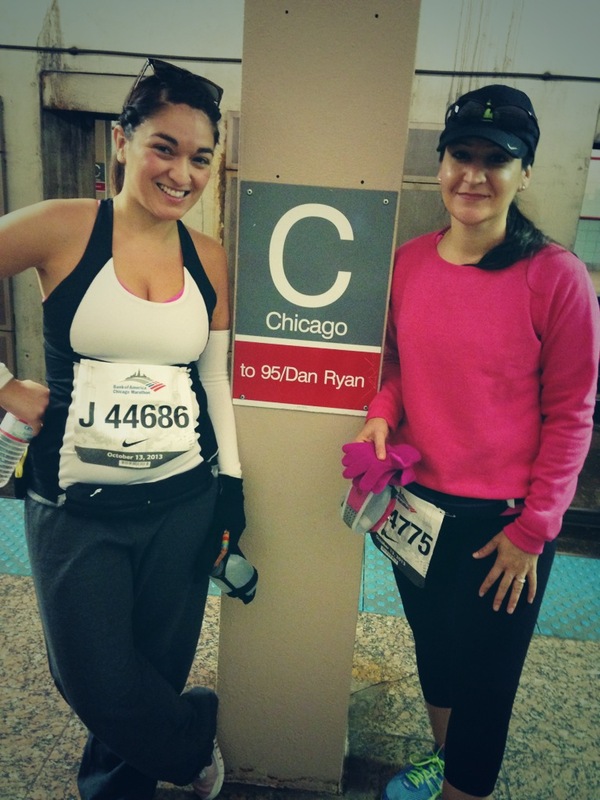 And like that, 05:44:20 after we started the 2013 Chicago Marathon, we were done running 26.2 miles! I’m not a big high fiver, but there’s something about running a marathon that makes you want to high five every person you see. That’s right; I’ll take pretzels from strangers and high five them. Hey don’t give. Afterwards volunteers bestowed upon us medals, then we hobbled to grab water, a box of snacks, a bag of ice and our free cup of beer. We sipped on our beers as we made our way to the exit, but had no problem giving up our beers for freedom outside of those gates. It turned out that our Starbucks meeting spot was perfect. We didn’t have to walk far to meet up with our crew. I was too tired to remember to get a photo of them. Sad. I was apparently also too tired to remember to eat anything out of my snack box. Our crew did get a photo of Beth and I as we waited for a train on our way to get an Italian beef sandwich. 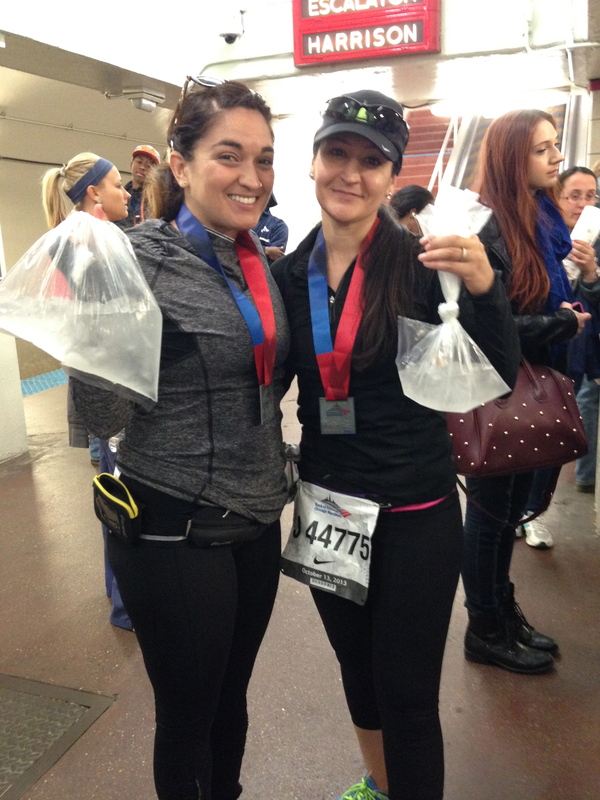 Ice is good for marathon runners. I think the whole “drink a beer and forget to eat the food in my box” was a mistake: I had to jump out of the crowded train after two stops because I felt like I was going to pass out. I leaned against a pole and slid down on to the gross subway platform floor. Call me classy. Then I started to dry heave as D and Rox probably began to try and figure out how to get me to a doctor. One of them handed me a bottle of water and I asked them to tell me what was in the snack box. When D pulled out some sort of beef jerky, I demanded it and devoured it. I followed it up with a granola bar and immediately felt better. Beef jerky and a granola bar go quite a long way. Lesson learned. As they stood staring at me, unsure of what to do next, I announced that I was ready to go get my Italian beef sandwich on from Portillo’s. They sort of glanced at each other, silently questioning whether they should listen to me. But I think the power of the Italian beef sandwich is strong and they agreed. And it was the best sandwich ever. 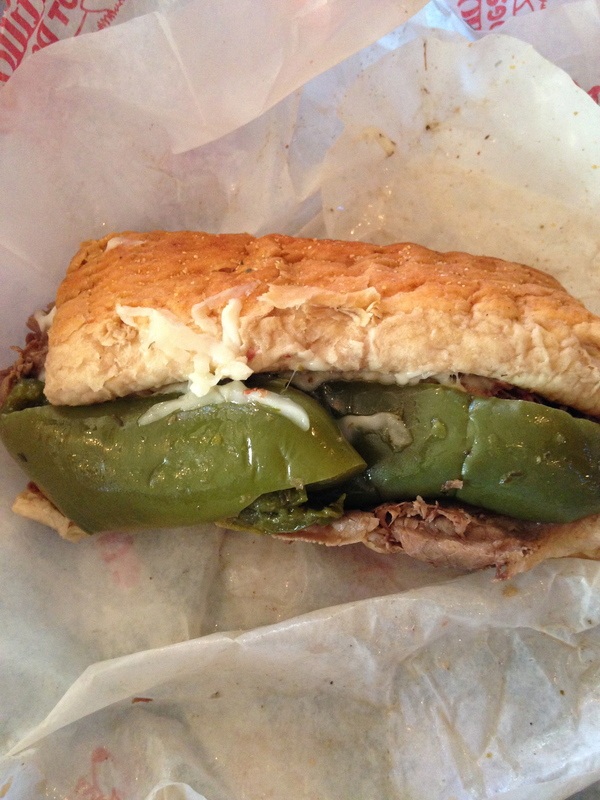 This photo does this Italian beef sandwich no justice. 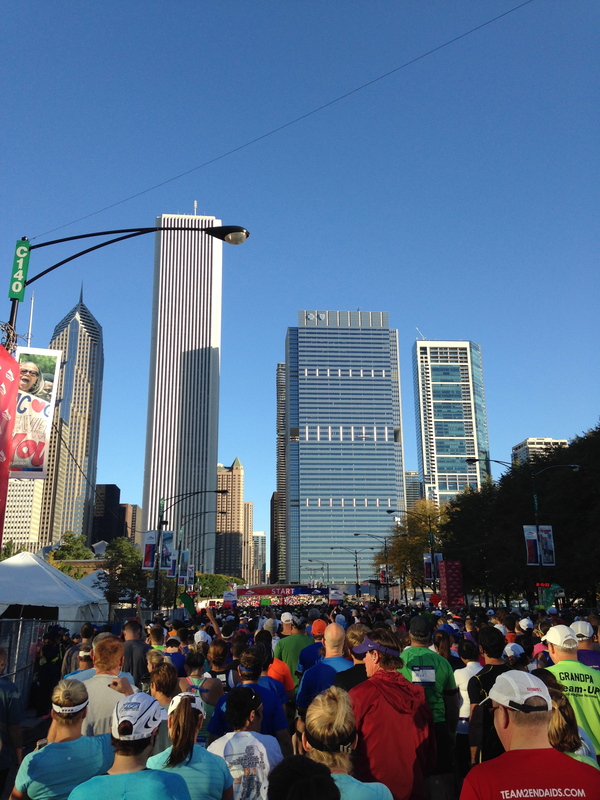 I would most definitely run the Chicago Marathon again. I loved the city, the food, the crowds and their incredible energy and the accessibility of everything. I whole-heartedly recommend this race to runners. I also recommend taking pretzels from strangers. 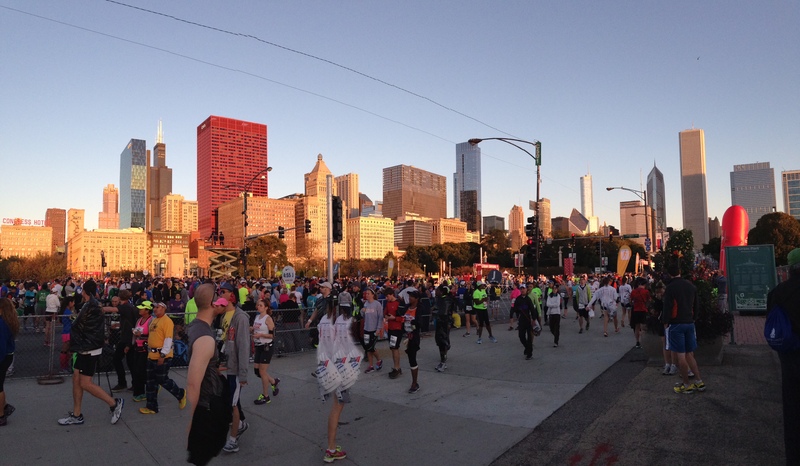 Have you run the Chicago Marathon? What was your favorite part? ← Good Luck to Me!